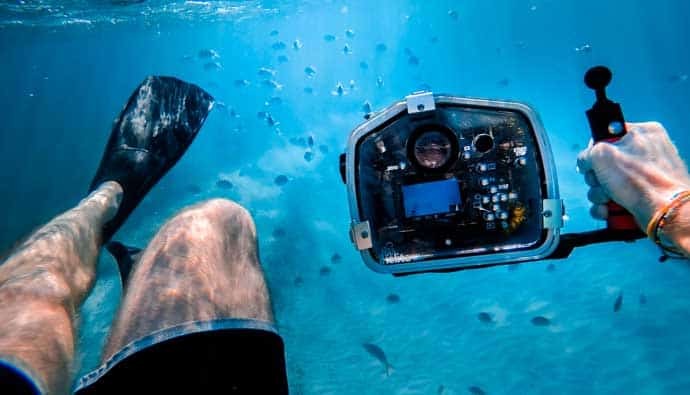 1 Why Do You Need An Underwater Fishing Camera? There is nothing more thrilling than landing that “Big Catch” and capturing it on camera. But what if you were able to see the action as it is unfolding under the water? In this article, I’ll cover five of the best underwater cameras for various fishing scenarios. Well, you can! With some of the most advanced underwater video equipment, you can see the action as it happens. You can see how fish react to baits that you would not ordinarily be able to see from and anglers viewpoint. Why Do You Need An Underwater Fishing Camera? The benefits of an underwater fishing camera are numerous. Some of the important reasons are “sizing up the competition” and allowing the angler to pick the more “hot spots” for bigger fish. An underwater camera allows you to see and study fish behavior and it allows you to see first hand from a fish’s perspective. This allows you to see how baits and lures respond in various water conditions and how fish respond to them. When the water is not clear, icy, or when you are in deep water, it can be difficult to spot fish. This is one of the challenging parts of ice fishing is knowing where the fish are. An underwater camera solves this problem with many options at the anglers disposal. Most of the more rugged underwater cameras are rated for as low as 14 degrees Fahrenheit with the average being 32 degrees Fahrenheit. It already a struggle to withstand the cold, why not use a camera to at least increase your chances of catching a fish for your efforts. I will also cover the basic functions of each camera, how to care for and maintain your underwater camera. I will also cover some basic repair, such as how to remove scratches from lenses and repair waterproof housings. Almost any camera can be used underwater if it has a housing. We’ll cover this style in another article. MAINTENANCE for your housing starts before you go diving. At the start of a trip, remove the sealing O-ring from its groove, and apply a small amount of the supplied O-ring grease. a seal. Do this while applying a light coating of grease to the O-ring, and every time you open and close your housing. KEEP YOUR HOUSING OUT of the sun to prevent camera fogging. The best sunscreen is a damp towel — if you’re out in the hot sun, just place the towel over your housing. Always keep a couple of desiccants in the housing to help prevent it from fogging. NEVER LEAVE your housing unattended in the camera-only rinse bucket, as this is where quite a bit of flooding occurs. People often throw their cameras in the bucket or will mishandle your system to make room for theirs. IS OVER, rinse your housing in fresh water to flush away all the salt water. Dip your housing in fresh water, and depress the control buttons in order to make sure all the salt is removed from the crevices. This should help you avoid costly repairs. 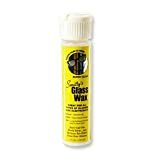 For minor scratches, we recommend using Smitty’s Glass Wax. It’s always good to have a friend with you in the water to help you capture unique shots, especially if you want to be in the frame. Waterproof housings are by far one of the most important items that require regular visual maintenance. This includes checking for leaks, foreign debris that can get trapped in between seals, worn and dried seals that may need to be replaced. What are you using it for and what types of conditions do you expect to encounter? What resolution will suffice your needs? Memory size – How long do you plan to shoot each day? How deep do you expect to take it? How do you plan to edit it? There is no doubt that underwater fishing cameras have brought anglers literally face to face with the fish. They have also allowed the sport of fishing to evolve in ways that could not have been imagined 50 years ago. 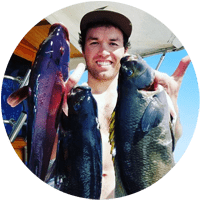 If you don’t already own an underwater fishing camera it is something you may want to consider, there is a certainty t it will bring the sport of fishing into a whole new light. A GoPro is essential for any spearo who’d like to showcase their shooting skills with their friends back at home. Most people don’t know what it takes to dive down and land a prized fish while holding your breath. With a GoPro, you’ll never miss showing off that stoned fish. The GoPro Hero 6 offers superior image quality. In the poorest conditions, the GoPro Hero 6 proves to produce a higher quality image than its predecessors. The GoPro Hero 6 works exceptionally well with natural light and equally as well even without a filter, but when you need the added light, the GoPro Hero 6 offers at least 1200 lumen light to get perfect color with a filter. While some people will say not to use a filter with light, it has been found that the GoPro Hero 6 produces great results when using the shallow (5-20ft) or dive (20-50 ft) filter. The GoPro Hero 6 offers a 4k 60p and 1080 240p frame rate, when played back on a compatible tv, gives extremely real and clear footage in HD that has to be seen to be believed. Playback options offer slow motion, which also adds stability to those shaky moments. The GoPro Hero 6 offers another advantage when it comes to lens and filters. This feature is known as the “Flip 6”. That makes the GoPro Hero 6 lens and filters compatible with its earlier family; the HERO 3, 3+,4, and 5. Flip Filters also means you can run any combination of filter and lens to get the shot that works best for your dive profile. 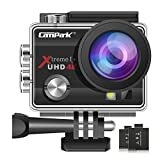 The Campark ACT74 Action Camera is more of a price friendly camera running between $50.00-$60.00 This camera is affordable on almost any budget. 2 inch HD screen + 170-degree wide angle lens. Waterproof up to 30m (98 feet). Dual recharger batteries + mounting accessory kit. The Campark ACT74 Action Camera offers a 4k resolution that is comparable to the GoPro Hero 5, with photo resolution being 16mp via the 170-degree wide angle lens. 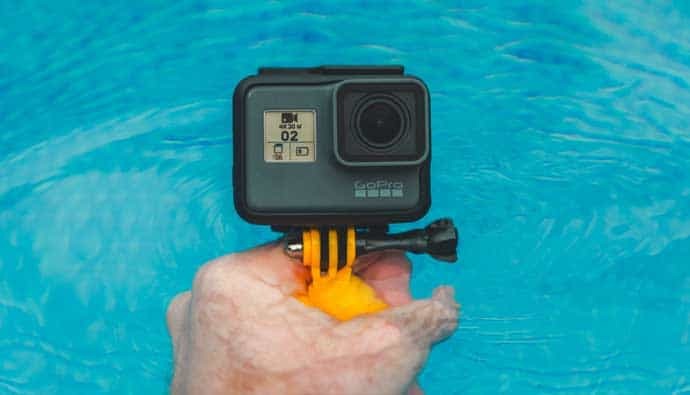 Waterproof capabilities; The Campark ACT74 Action Camera comes with a waterproof case that allows it to go down to 100 feet, while it can dive up to an impressive 33 feet without the case. Storage capability; The Campark74 Action Camera is more lacking it this department with up to 64gb which is considerably less than the HERO series that store up to 128gb. Voice Control: While the HERO series 5 & 6 cameras offer HDMI and wifi the Campark74 Action Camera offers these features as well, and additionally Bluetooth. Display; The Capark74 Action Camera offers a 2-inch color display screen that is not touch screen, where the HERO series 5 & 6 do offer the touchscreen feature. 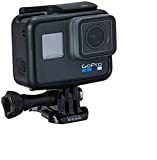 Included accessories; When you purchase a Campark74 Action Camera, you can expect it to include, the waterproof case, two rechargeable batteries, charging cable, and a variety of clips mounts and brackets that will fit most any situation. MONITOR: 7 inch TFT color monitor with sun-visor for bright environments. FEATURES: Underwater Fishing Camera, Sony CCD 800TVL HD Video Camera with 360 Degree View and an OSD Menu Remote Control Fish Finder Camera. There are 16 high-power white LED lights for the camera. BATTERY: Continuous usage of the battery lasts up to 10 hours. The light indicator will show red while charging and when the battery is full, it will show green. CABLES: The cables are weather resistant, waterproof and pull-resistant cables. The available camera extension cable length is 20 meters. USAGE: Ideal Underwater Camera for monitoring aquaculture, underwater exploration, ocean/ice/lake fishing, underwater salvage and so much more. 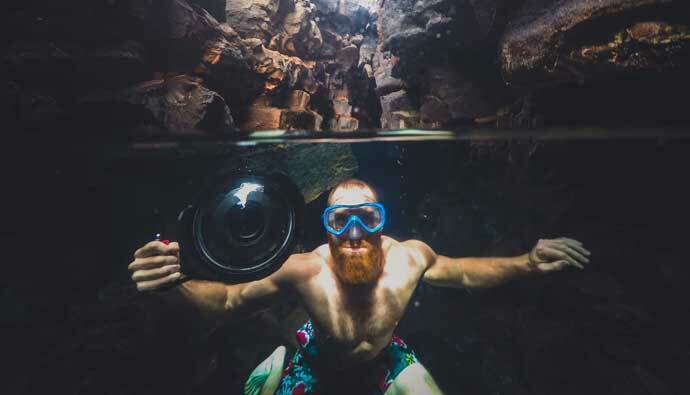 When it comes to underwater cameras, there are several factors to consider when deciding on the right camera to fit your need. In the case of Ice Fishing, The elements definitely are a factor not to be overlooked. Thant where we take a look at the Marcum Underwater Camera. A bait camera will get you just about as close to the action as you can get. Not only does it give you the advantage of seeing the fish at the moment it takes the bit, it also allows you to see and study how various baits are performing underwater. Before the advent of underwater cameras, an angler could only guess how well their baits were performing. Now, with underwater technology, anglers and not only study baits, but also fish behavior. Sony Super HAD CCD, .05 lux camera with 60′ of cable and stabilizer fin. 7″ high-resolution, rubber-coated black & white CRT monitor. Darkwater LED lighting technology greatly reduces particle reflection for a brighter, and clearer view. 12V, 7Ah rechargeable battery and 3-stage auto battery charger. Soft padded carry/storage pack with built-in sun shield.